Three dancers stand before the Civic’s stage curtain, their backs to the audience. But such is the world of Nederland Dans Theatre. Unexpected, deliberate, meticulous. The prolonged silence is the opening sequence for Safe as Houses, a 33 minute meditation on the relationships between the body and the world, the soul and its environment. As the last warmth of the house lights recedes, the curtain rises and the dancers begin to move. Quick, deft and exacting, their gestures reflect both classical training and a contemporary modern dance vocabulary. Choreographed by the company’s artistic director Paul Lightfoot and artistic advisor Sol León, the work is inspired by the ancient Chinese I Ching (Book of Changes). Fluorescent white silk screens with gossamer etchings and Bach’s rich scores provide the ideal aural backdrop. As the music swells so does the ensemble, its members displaying an almost ferocious dexterity as their movements are juxtaposed with the familiar Baroque melodies. An elusive white wall is a literal turning point in a surrealist world that is slow, poignant and cyclic. When it ends, almost far too soon, our reverie is broken. Woke Up Blind is a complete change of pace. Beneath damp blue lighting there is a sense of loneliness, tragedy and loss, yet it is also sharp, tinged with a sexual rawness. To a soundtrack of Jeff Buckley’s You and I and The Way Young Lovers Do, choreographer Marco Goecke takes us away to an underground of sweet smoky tunes where his brilliant use of pace and vivid colour (he also designed the costumes) builds to an explosive frenzy. However, Crystal Pite’s The Statement is no shy third in this programme. A voiceover (or more appropriately, a vocal composition) by Jonathan Young carries the dramatic narrative of what happens around a corporate boardroom table. Wrenching us from a world of abstract ideas and images, here the movement reflects a kaleidoscope of recognisable emotions: defiance, appeasement, persuasion, desperation. Stop-Motion returns us to the choreography of Lightfoot and Leon. Drawing upon layered images, this final piece is exquisite. Delayed projections, including a young woman in a beautiful black period dress, foreground the drama that takes place upstage. The dancers’ solos are magnetic, a balance of strident masculinity and empowered femininity. The multimedia narrative surges and finally, in almost Brechtian fashion, concludes with a deliberate exposé of all the mechanics of these constructed worlds. Nothing is left except the simple and profound beauty of two dancers on stage. 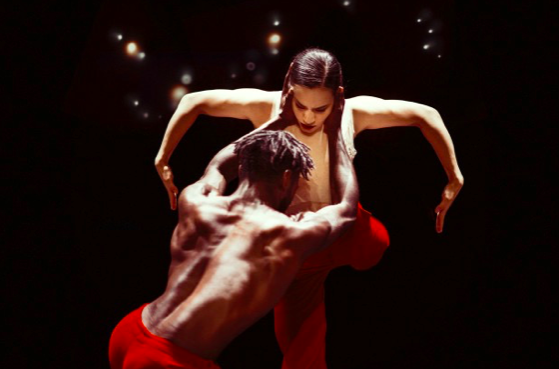 Performing in New Zealand for the first time, Nederland Dans Theatre brings a sublime display of choreographic mastery and physical virtuosity. This is contemporary dance at its most magical.